Near the traffic lights of the crossroad in Ver-sur-Mer stands a Sexton. This Canadian version (recognisable through the 'Dry Pin' tracks)of the self-propelled howitzer is placed by Dr Matthew Kiln as a memorial to his father and the British troops that landed here. After your visit to the Sexton, cross the D 514 to drive to the coast by the Avenue de Colonel Harper, which becomes the Rue de Mer. At the end of this street, you’ll see the tower of the lifeguard. 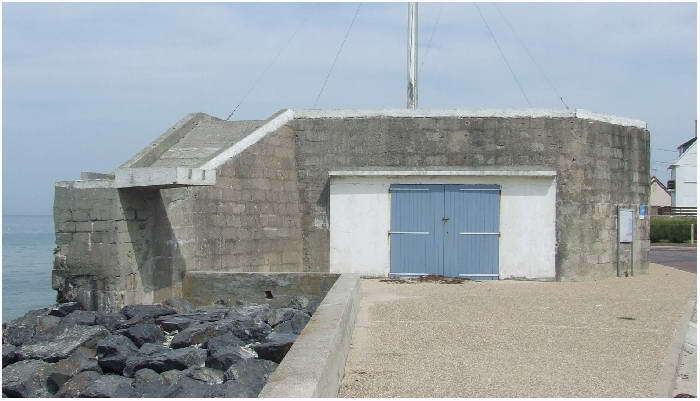 It is built atop of former bunker which once held a 5cm gun. This is King Red sector ‘Gold Beach’. You are now in Wn 33. Go lef ton the Boulevard de la Plage. After some 300 meters, you find a heavy casemat, a type H 677. On June 6th 1944 an 8,8cm Pak 43/41 gun knocked out two AVRE tanks. The explosions of these tanks brought some casualties among men of the 280th Field Company and 5th East York’s D Company. Because of German rifle and mortar fire, some casualties where made during the first minutes of the landings here, among them a couple of officers. 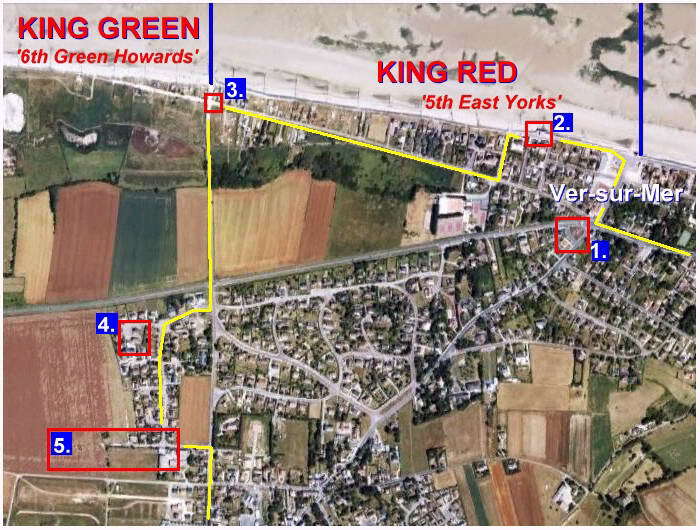 After thirty minutes the survivors of D en C Company, of the 5th East York’s were pinned down behind the seawall. Three LCG (Large) and two other vessels moved closer to the coast, and opened fire from a kilometre into the German positions. Meanwhile some tanks of the 4th/7th RDG towards Wn 33. On the beach a Sherman Crab was immobilised, but his gun was in good working order. It shot a couple of shells into the 8,8cm casemat, which finally ceased it’s fire. With this threat out of the way, the houses in the vicinity could be searched. Around 11.00 hours the last 40 Germans of the 7/GR 736 under the command of Hauptmann Gustav Adolf Lutz, surrenderd. Move along the sector King Red to the west. Take the corner in the road, and after some 100 meters go right into the Voie de Débarquement. Stop near the crossing which leads to the beach (right) and the one leading into the mainland (left). This is the line of sector King Red with the sector King Green. In this area landed the A and D Companies of the 6th Green Howards without to much struggle. This was partly due the fact that with the infantry some tanks came ashore. Among them DD and AVRE tanks who soften the defence of Wn 35 which was situated some 750 meters to the west from the point where you are now, Paisty Vert. At the corner you notice a small building, some kind of stone shed. This is a former shelter of the railroad that once run here in the past. 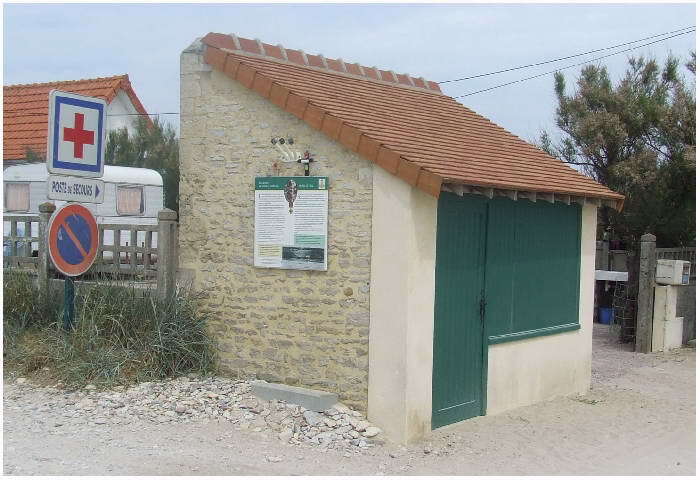 It was until recent a derelict, but when it was adopted by the Green Howard's (Princess of Wales’s Own Yorkshire Regiment), it was restored in 2006 and named ‘Hollis VC Hut’. 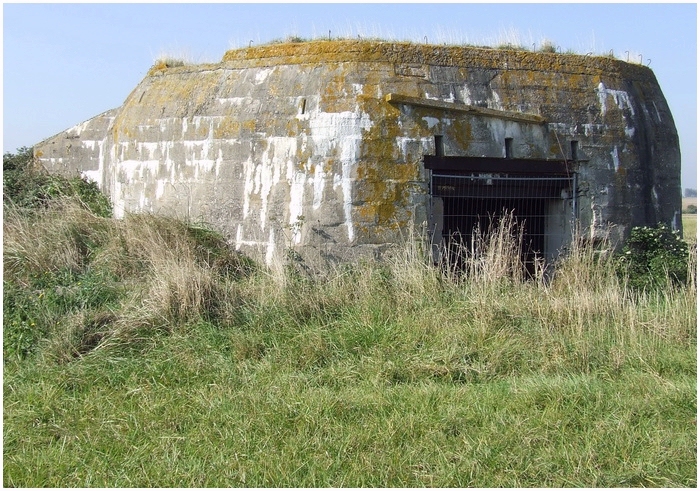 Because of it’s shape, the Allies thought it was a German bunker, and it was shelled during the landings, but was not hit a single time. Now, turn left, into the mainland, by the Herbage de Pres, towards the Battery of Mont Fleury. Cross the D 514 and move into the village. Take the first street on your right, the Rue Claude Debussy, move through the left corner, and all the way to the end of the street. In front of you, you see the first casemat of the Battery Mont Fleury. 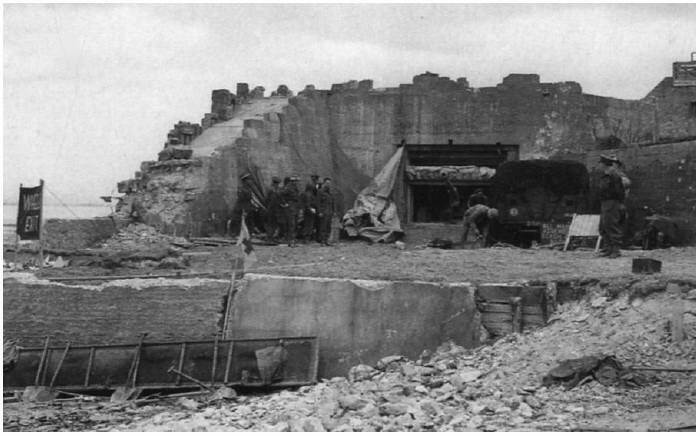 During D-Day, this complex was still under construction. If the landings were postponed, for say a month, the guns could have made havoc among the forces on the shipping and landingcraft. The casemat in front of you was the only one which was operational with a Russian 122mm canon. It managed to fire just three rounds, before it fell silent. The three other canons were hidden in trenches nearby, and could not be used, also because they were damaged during the bombardment before the landings took place. From this casemat, walk left on the Rue Hector Berlioz to see the other casemats. The first casemat on the right side of the street, is refurbished by it’s new owners. It now has a concrete wall, so a terrace was created on top of the casemat. The impact of a bomb can still be seen on the back. A fifty meters further is another casemat. It has never been completed, the walls are standing, but a roof is lacking. Here is good to see how the Germans constructed these things at later stadium of the war. 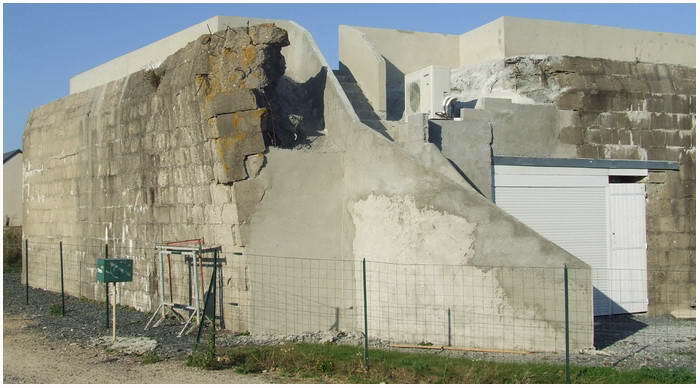 To save time, two walls were built on top of a concrete foundation, and the space between the walls was filled up with concrete. In the field another construction can be seen, which never has been finished. 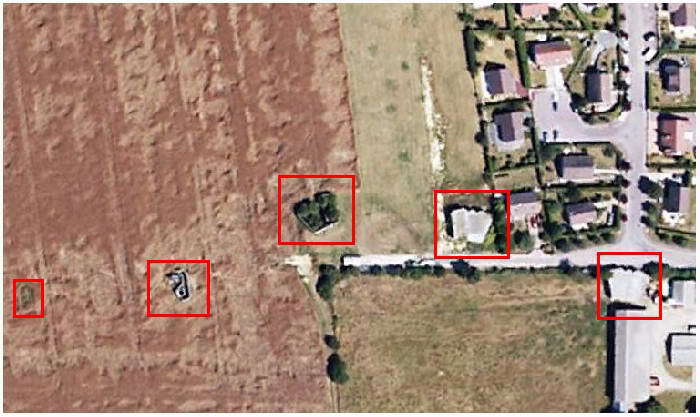 In front of this complex in the field, a couple of hundred meters towards the sea, lay some other bunkers and trenches (now gone). Here started the action, in which CSM Hollis made a name for himself, which would lead to the only Victoria Cross given on D-Day. 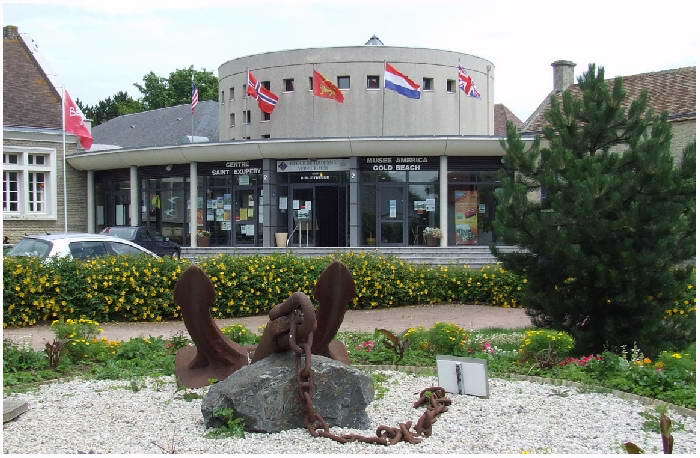 If you got some time on your hand, you must make a stop at the Musée Gold Beach in Ver-sur-Mer (follow the sings). The museum is small, but more the worth the visit. It is split into two sections. The first is on the first mail flight from the United States to France on June 29, 1927, by Byrd, Acosta, Balchen en Noville. Flying in the Fokker America, they lost their way in the fog around Paris. They headed for the coast and ditched their plane just out of the coast at Ver-sur-Mer. The other part of the museum is about the preparations for D-Day for the British troops that were to land at Gold Beach. 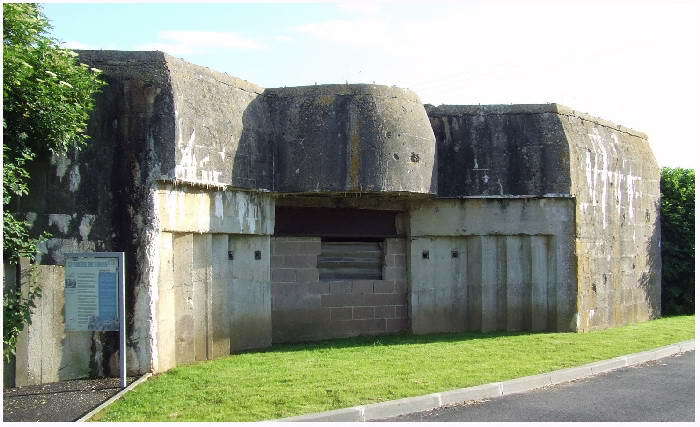 Then there is more on the fighting for the beaches and the construction of the first airfield, the ALG (Advanced Landing Grounds) 'B1' near Ver-sur-Mer. The objects that are on show are nicely preserved in fantastic setting and light. Even so of a great standard are the diorama’s, which will be highly appreciated by the amateur model builder. The very nice owner speaks good English, and will give you a good explanation, if you need any. 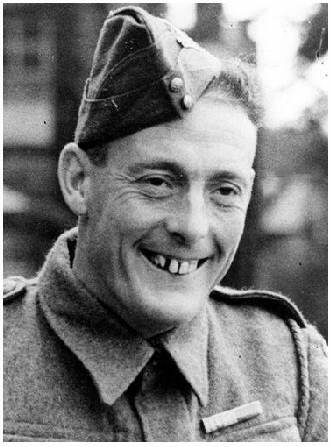 Stanley Elton Hollis, a veteran who landed before with the 8th Army in North Africa and Sicily, had a lot of hatred in his blood against the Germans. During the retreat to Dunkirk in 1940, he came across a street in Lille where civilians were slaughtered by German soldiers. Until D-Day he had already made 90 notches in his weapon, one for each German he had killed. 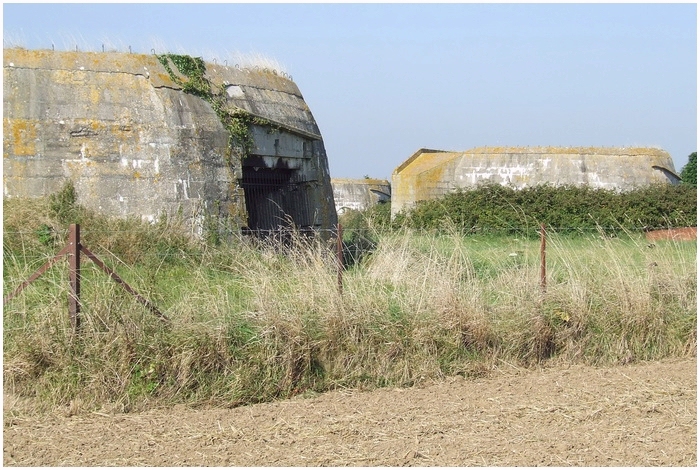 Sergeant Major Hollis, in company of Ronnie Lofthouse, commander of D Company, 6th Green Howards, had just crossed the, now called, D 514, when Lofthouse discovered a bunker on his right side, just in front of the battery of Mont Fleury. When they wanted to inspect the place, they came under German fire. Hollis waited not a second, and firing his Stengun, run towards the bunker. It was a miracle he was not struck by the flying bullets fired upon him. When he reached the bunker, he managed, standing on the roof, to throw a grenade into it. He jumped into a trench that lead into the bunker where he found two dead Germans and a couple of dazed once. Hollis ordered the Germans to surrender and he sent his prisoners into the open. Hollis then followed the trench towards another bunker, again firing his Stengun. The Germans in this bunker were not into fighting this ‘madman’, and surrendered to him. In a couple of minutes, Hollis made 20 prisoners. In securing this position, Hollis saved probably many British lives. When D Company moved further into the complex, Hollis noticed some fleeing Germans, who jumped over a low wall. With a borrowed rifle, he managed to shoot one of them. But at that moment he was struck in his cheek. He bled violently, but if this put Hollis off, not in the least! 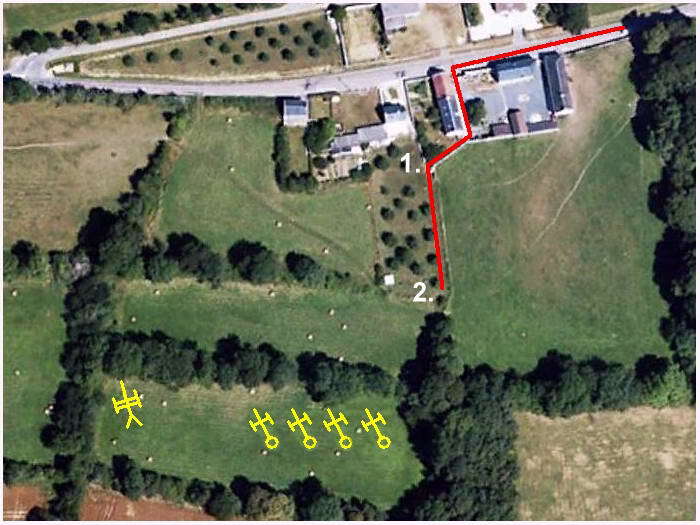 The Battery Mont Fleury was taken without many resistance, and was firmly in the hands of the Green Howards by 09.45 hours. After Mont Fleury, turn right, onto the D 112, heading inland, towards Crépon. Because of the lossess among the officers, CSM Hollis got the command over 16 Platoon, D Company of the 6th Green Howards. With his team he went through Crépon. 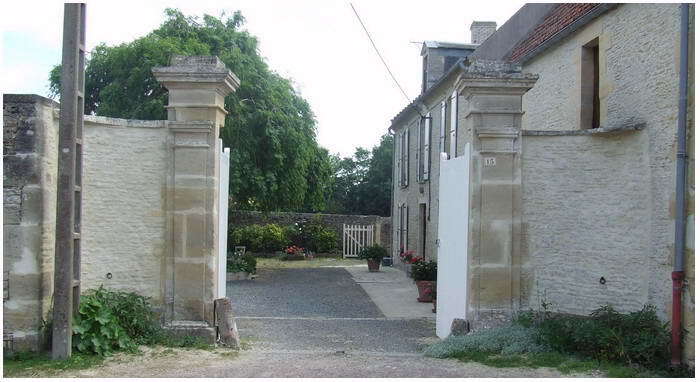 Here they searched some houses and the farm ‘le Pavillon’ for Germans. In the last house they only found a stricken boy, who had the scare of his life seeing the bloody face of Hollis. Some noise behind the farm made Hollis curious. When he looked around a wall, he was almost hit by a bullet which ricocheted against the stones. He saw some dogs playing and suspected Germans behind the trees, when he noticed the barrel of a canon. He sent some of his men with a Bren machinegun to the spot, but they became trapped in a murderess fire and were all gun downed. Hollis decides to get a PIAT, and under covering fire from two other Bren teams, he aimed and fired, but the shot fell short. But he got the attention of the Germans, who lowered the barrel of the gun to fire upon him. When Hollis decided to make a run for it, the gun fired, but it only hit the chimney of the house. Unfortunately, the two Bren teams were pinned down. Hollis, who felt responsible for the ordeal, swapped his PIAT for a Bren and went back to the orchard. He positioned himself standing in the open, and began firing from the hip, so the other Bren gunners could return. The overall commander, Major Lofthouse decided to encircle Wn 36a, and move further, and leave the guns to the forces who were following them. When the evening fell on D-Day, CSM Hollis his tally of notches stood at 102. 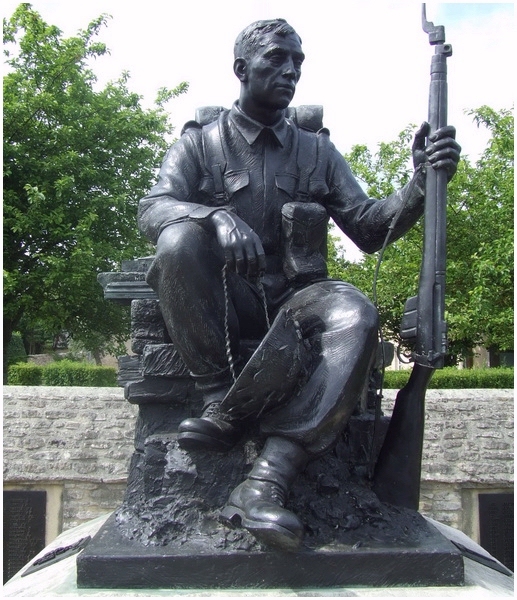 His actions during the day brought him also the highest medal there is in the British army, the Victoria Cross. Hollis died on 8 February, 1972 and after his dead, his VC was sold in 1983 for £30.000 (around € 50.000 in today’s money). 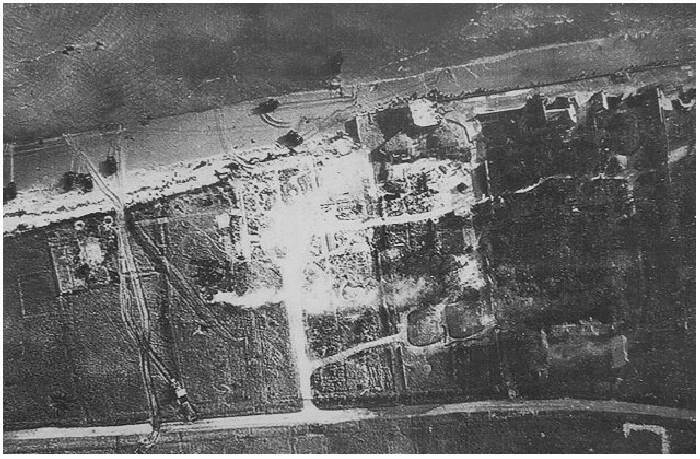 Only the next day, June 7, WN 36A, which was operated by men of the 5/AR 1716, was taken. To accomplish this, the attackers needed some Sherman Crabs and a Churchill Crocodile (flamethrower tank) of the 86th Field Regiment. But finally the 60 Germans gave in and the five canons were in British hands. Continue on this road (D 112) to Crépon. Soon after you leave Ver-sur-Mer, you see on the left a small road, Rue Marefontaine. This leads to the battery of Marefontaine. Pass the hotel and go straight ahead and follow the country road. After a couple of hundred yards you see the four massive casemats. Thes contained 100mm guns with a range of 9 km. 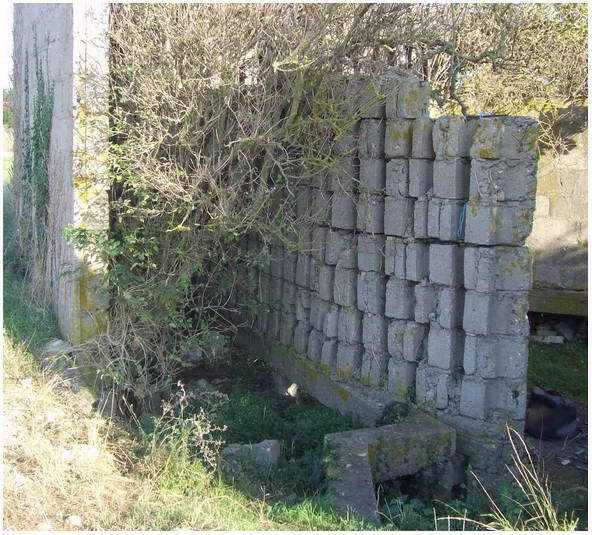 This battery was controlled from a observation post at Widerstandnest 35b. Wn 35b was hidden in the woods of Maromme on the high ground of Meuvaines. During D-Day some 250 grenades were dropped in two hours of time. 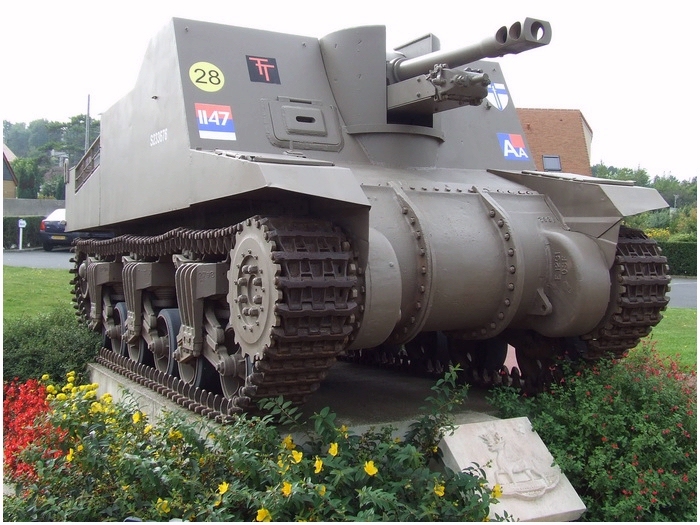 With the help of flamethrower tanks of Troop 13, 141st RAC the Germans surrendered. Go back to the D 112 and continue south to the D 65 and Creully. Cross the D 12 and continue on the D 22. 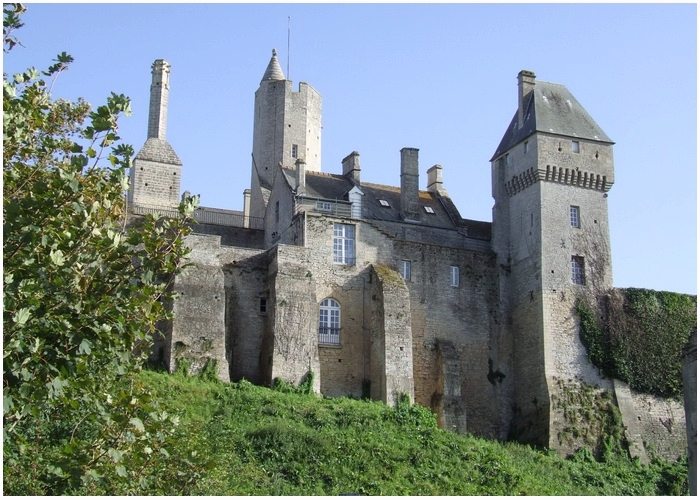 Just before crossing the River Seulles you'll see over your right shoulder Castle Creullet. 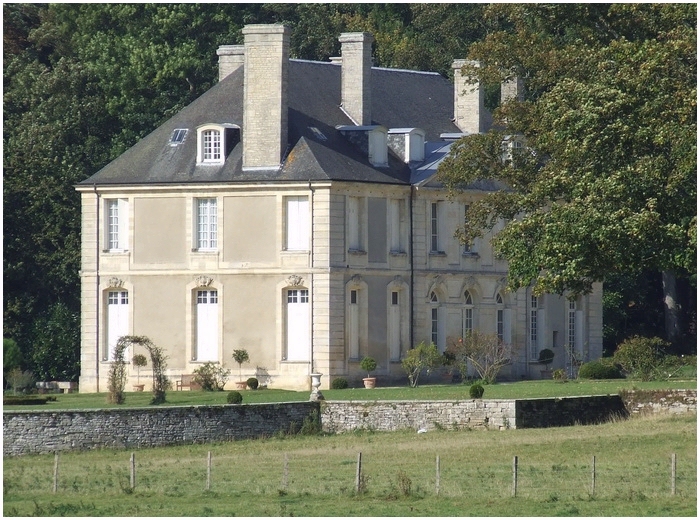 Near the castle, Château Creullet, Generaal Montgomery parked his caravan on 9 June and installed here his headquarters. Some of the guests who came here were Winston Churchill on 12 June and King George IV on 16 June. Saucy detail: Montgomery discovered his caravan was lacking a toilet, so he borrowed a piss-pot from the castle, nicely decorated with pink flowers! Creully Château, from were the BBC had their broadcast. Follow the road and cross the river and take the hill, turn left at the First World War monument. This is the castle (the town-hall) from were the BBC put out their broadcasts about the proceeding on the Normandy campaign. During office hours you may visit the small tower and the studio. At the bottom of the wall, out side the walls of the Creully Château (towards Château Creullet there is a monument for the 4th and 7th Royal Dragoon Guards. 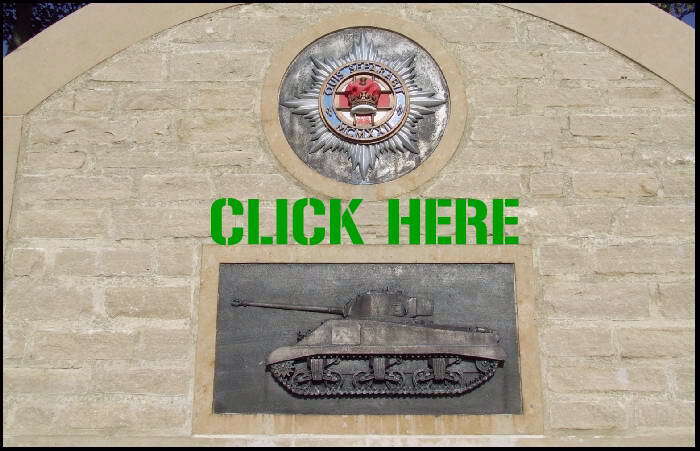 Click below on a detail of this monument and you move towards the page on Bazenville, Asnelles and Arromanches and her Mulberry harbour.